Basseterre, St. Kitts and Nevis, 14th March 2018 — A local cancer support organisation recently received a much needed financial boost to support its life-saving work in the Federation. During a brief handing over ceremony last month at its headquarters in Basseterre, Business Support Officer, Jewel Wattley of CIBC FirstCaribbean presented a cheque for E.C. $33,000.00 to a A Time for Us Foundation. The funds were raised as part of the bank’s annual “Walk for the Cure” initiative held on November 5th, 2017 and which drew hundreds in a show of solidarity towards cancer fighting initiatives in the Federation. 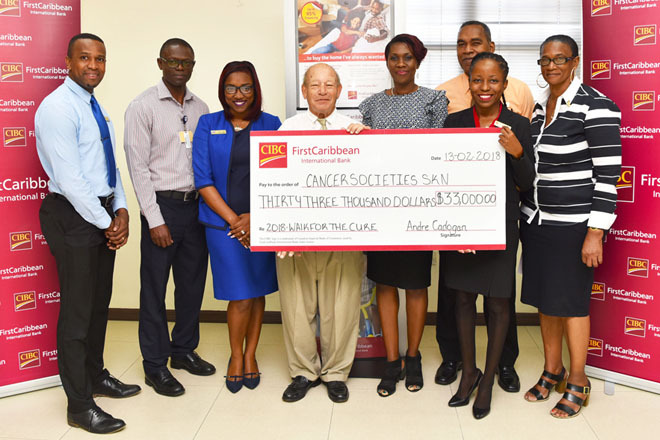 The bank’s Country Manager Andre Cadogan, lauded the organization and the tremendous impact that it has had in not only raising awareness of cancer in the Federation, but also its ability to raise significant funds towards fighting the disease. He also used the opportunity to implore all stakeholders to be proactive in addressing the lack of awareness and lack of resources to fight the deadly disease. Also present were representatives from the various corporate sponsors and contributors whose generosity coupled with the hard work of the Walk for the Cure Committee accounted for the funds raised. Corporate partners this year included: Gold Sponsor: Rams and SKNVibes, Silver Sponsors: Royal Beach Casino and Kajola Kristada Limited, Bronze Sponsors: Mitchum and Benjamin Legal Chambers and Delta Petroleum and Event Contributors: T.D.C. The “Walk for the Cure” was one of many similar events that took place in the month of November across CIBC FirstCaribbean territories in the Caribbean and in Canada at the bank’s parent company, which held it is annual Run for the Cure which has raised millions over the past two decades in support of cancer research.